Little, Brown Books for Young Readers, 9780316501859, 256pp. 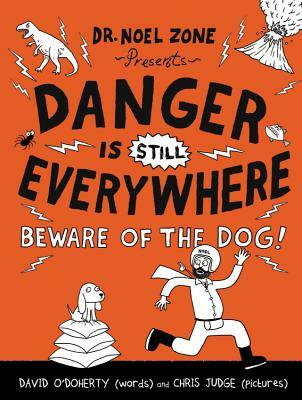 This wacky handbook teaches readers how to avoid danger of even more kinds--from dinosaurs to volcanoes to the circus--plus the overwhelming danger of a real live puppy. A little dog called Napkin has come to stay with Dr. Noel Zone, but every POD (Pupil of Dangerology) knows the only safe pet is a pet rock. As Napkin wreaks havoc around the Dangerzone, Dr. Noel will have to work up the courage to keep teaching readers his valuable safety lessons (and to leave the safety of his wardrobe)!